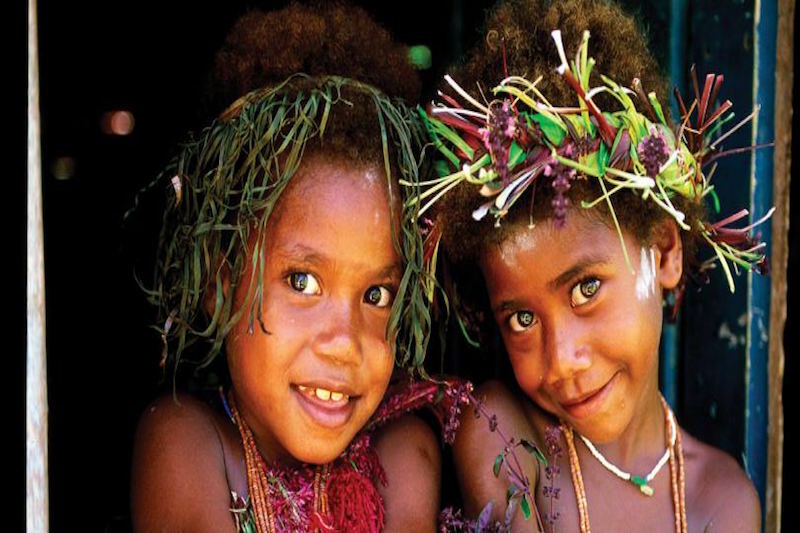 There is no place on earth like Papua. 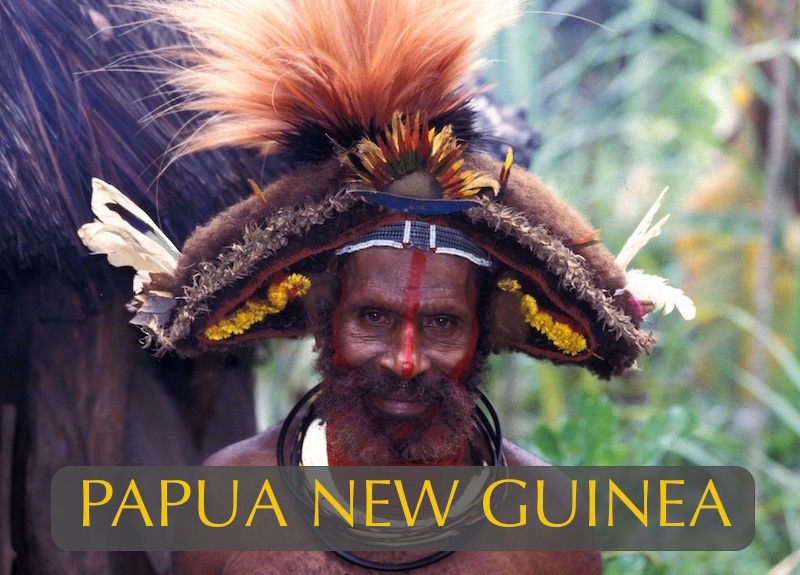 The island of New Guinea is not only our planet’s highest and second largest island, it boasts an astonishing diversity of flora and fauna and is home to the world’s greatest number of human cultures and languages. This study adventure offers international school students experiences most people can’t even imagine. From Port Moresby we will fly to the remote Tari Valley in the central highlands of New Guinea to immerse ourselves in the culture of the Huli – a tribal group of warriors and horticulturalists that was completely unknown to the outside world until 1935 when a few Australian gold seekers stumbled upon them. Displaying the most artistic body expressions of any society on earth, the Huli “wig men” immediately captured the world’s attention. Students on this trip will look at the impacts of religious conversion and colonization on Huli culture and their remarkable resilience to change. They will learn to prepare and plant garden plots for yams, sweet potato and cassava on lands that have been cultivated longer than any others on earth. Students will learn to start a fire using bamboo chord as our Neolithic ancestors once did. They will cook food underground in a traditional “Mumu”, decorate themselves with elaborate face paints and bird of paradise feathers, join in celebratory “sing sings” and overnight in a communal Huli hut. One of the most endearing traditions still alive in the Tari Valley are the Huli “wig schools” where young men submit themselves to monastic conditions for 18 months while they grow their hair into elaborate wigs that will be used for ceremonial purposes. 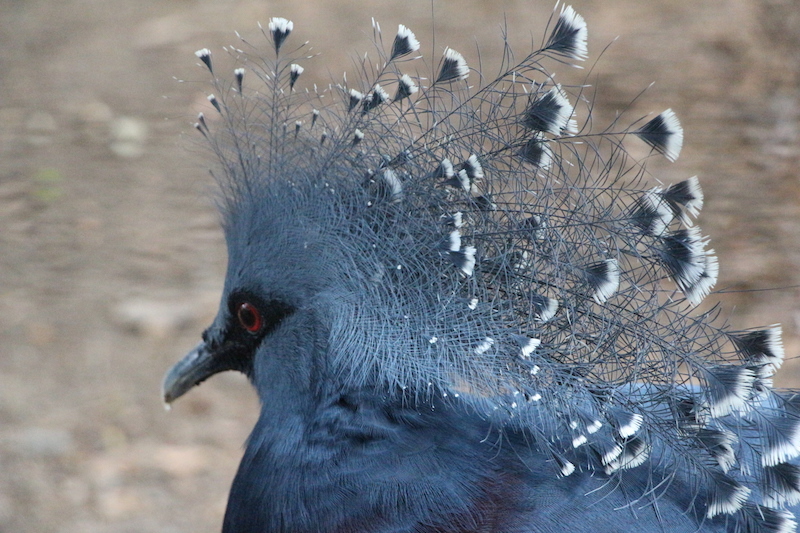 Spectacular bird of paradise feathers adorn these wigs from a great range of species found in the Tari Valley. Students too will have opportunities to view these majestic birds in their native habitat at 9,200 ft. in the Tari Gap and at lower elevations during rainforest hikes to breathtaking waterfalls. After four amazing days exploring the highlands, we fly back to Port Moresby and boat to an offshore island to discover an entirely different realm. 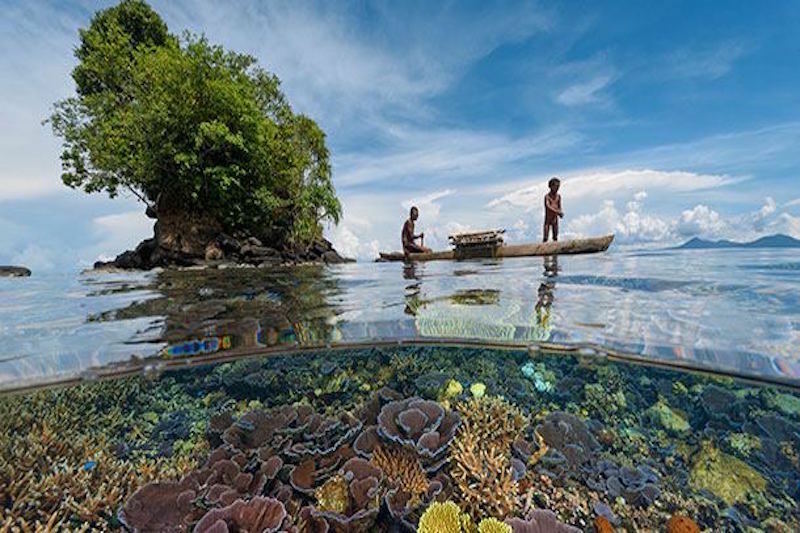 New Guinea sits at the eastern edge of the Coral Triangle with the world’s greatest diversity of coral reef life. Based at a comfortable dive lodge, students will set out by boat daily to explore a number of islands, snorkel over pristine reefs and meet some of the delightful island peoples of Melanesia. 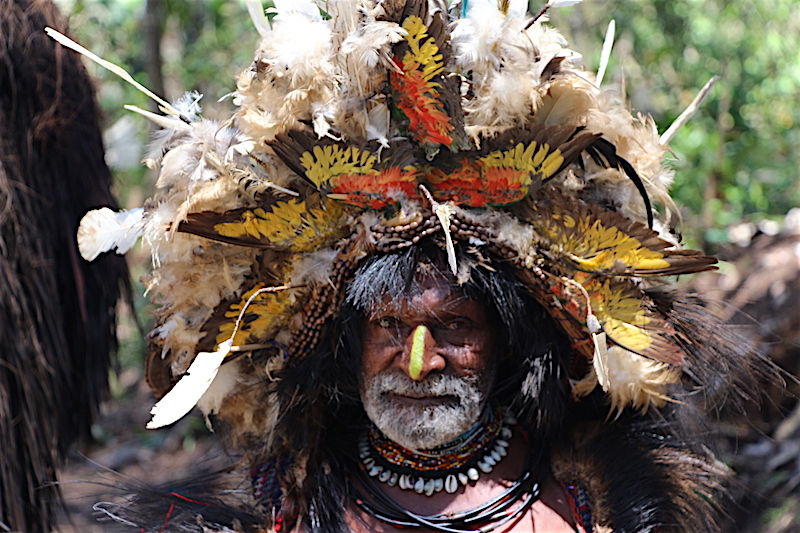 “Expect the unexpected,” it is said of New Guinea, but students on this unique learning adventure are likely to have their expectations surpassed. Students arriving in Port Moresby very early on a night flight from Singapore or Manila will be met by our staff and taken for breakfast before boarding an Air Niugini flight at 9:00 am for Tari. Looking out the windows during the flight over the New Guinea coast and highlands will reveal to students the wilderness nature of this massive and little explored island. Landing in Tari after a 1-hour flight, students will be transported by tourist bus 45-minutes to beautiful Ambua Lodge at 7,500 meters above sea level. Here in the delightfully cool climate of the highlands, we will check into private 2-person Huli-style cottages equipped with all modern amenities and enjoy stunning 180-degree views of the Tari Valley. Following a trip orientation session and a delicious lunch students will have time to rest for a few hours from their long travels. At 3:00 pm, we will set off on a short hike to a spectacular waterfall where students can swim in the cool waters of a large pool at the base of the falls and start recording high elevation bird species. Returning to our lodge there will be a formal presentation on the geography and geology of New Guinea before dinner. Following a delicious dinner in Ambua’s elegant lounge and dining room, students will watch an educational video on New Guinea’s birds of paradise and bowerbirds. Everyone rises early this morning for birds viewing around the lodge grounds at the time of day birds are most active. 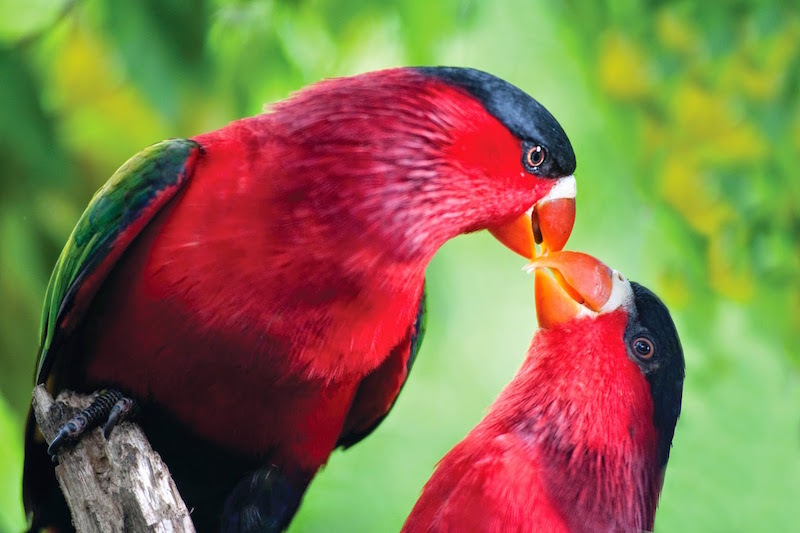 New Guinea has one of the richest and most varied avifaunas in the world with 708 birds listed. It is common to sight and record more than 30 highland species right around our resort. At 8:00 am we enjoy a delicious breakfast featuring homemade baked goods, fresh tropical fruits and free-range eggs. We then set off on a morning hike, exploring the high elevation “montane” rainforest with opportunities to cross three liana vine suspension bridges and visit several beautiful waterfalls. Students need to keep a sharp eye out for some of New Guinea’s rare endemic birds during the hike, like the flightless dwarf cassowary and the elegant Stephanie’s Astrapia with it’s showy tail feathers used in Huli headdress decorations. We will enjoy a picnic lunch on a hilltop clearing at the end of our hike from which we can continue spotting and recording bird species. Returning to our lodge, students will have time to record in their trip journals before we set off again at 3:30 pm on a bus trip to Tari Gap in search of New Guinea’s famous birds of paradise. 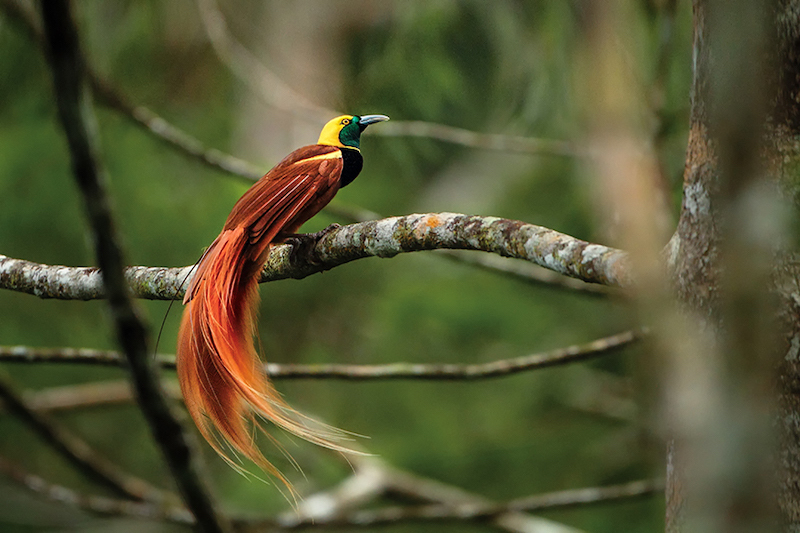 There are 43 birds of paradise on earth, 38 of which occur in New Guinea. In the last century, the millinery trade shipped staggering numbers of these birds to Europe and America and decimated their population. Today all birds of paradise in Papua New Guinea are officially protected, but logging now poses a new threat to their extinction. Once we are dropped off at Tari Gap (elevation 9,200 feet), we will slowly walk back down along the road we came up on in search of some of the showiest birds on earth. The blue bird of paradise and superb bird of paradise with their flashy iridescent breast feathers, and the King of Saxony bird of paradise with its spectacularly long and dazzling head feathers are often spotted in these cloud forests along with many other species. We return to our lodge at sunset to watch amazing colors spread across the valley sky and sit down for another wonderful dinner in the fireside comfort of our lodge. This evening students will enjoy another short talk and video after dinner. In preparation for our cultural immersion experiences the next day, we will show the Academy Award nominated film for best documentary: “First Contact” that chronicles with actual footage the first contact the New Guinea highlanders had with the outside world. Right after breakfast this morning students will have a briefing on Huli history and culture before departing our lodge with overnight daypacks for a full cultural immersion experience. The most important lesson for students to bear in mind all day is that wherever they trek in Huli territory, they are trekking in someone’s backyard. Driving down a short distance into the Tari Valley, we will stop at a Huli wig school, an ancient and still intact tradition where young men submit to monastic-like disciplines for 18-months while they grow their hair into elaborate wigs. Special magic, a restricted diet and abstinence from women help these young bachelors grow their hair strong and fast until it is long enough for their cult expert to fashion with a circular band of bamboo into a mushroom shape. For a year and a half the boys must sleep on a neck rest to prevent the coif from being squashed until it is time to be cut it close to the scalp and mold it into a Huli wig. Many boys will repeat this 18-month ordeal for 3-5 years in preparation for manhood. After leaving the Huli cult of the bachelor school we will hike through the Tari Valley immersing ourselves in the daily lives of Huli people. We will honor the gender roles in Huli society by dividing tasks between male and female students. Boys will help prepare raised ground plots that girls will plant with sweet potato tubers, yams and cassava. Boys will build fires with bamboo chords and practice hunting skills with bows and arrows while girls will harvest foods and prepare a traditional “Mumu” – an underground oven to cook a traditional dinner of yams, cassava, sweet potato, chicken, pig and bananas. During the hours it takes for our dinner to bake in the “Mumu” – a banana leaf lined underground oven heated with hot rocks – students will have time to paint faces in traditional Huli designs and decorate their hair with cuscus fur, cassowary feathers and plumes from birds of paradise. After our “Mumu” feast, Huli shaman will perform a traditional spirit dance to be followed by studentshaving a sharing circle around the ceremonial fire. At the conclusion of the evening, we will bed down in separate Huli clan houses for males and females to complete our full immersion experience. Waking up on a cool morning in a Huli family compound students can join our hosts warming up around an open fire before breakfast. After bidding farewell to our host family, we drive a short distance to a primary school in either Tigibi or Wabia villages where international students will engage in a full day service project. Repair and replacement work to the facilities will be combined with international school students engaging with the Huli children in teaching them English language skills, lessons in world geography and enjoying interactive games together. A picnic lunch will be served at our work site. Returning to the luxury of Ambua Lodge in the late afternoon, students can enjoy hot showers and time to catch up on their trip journals before dinner. 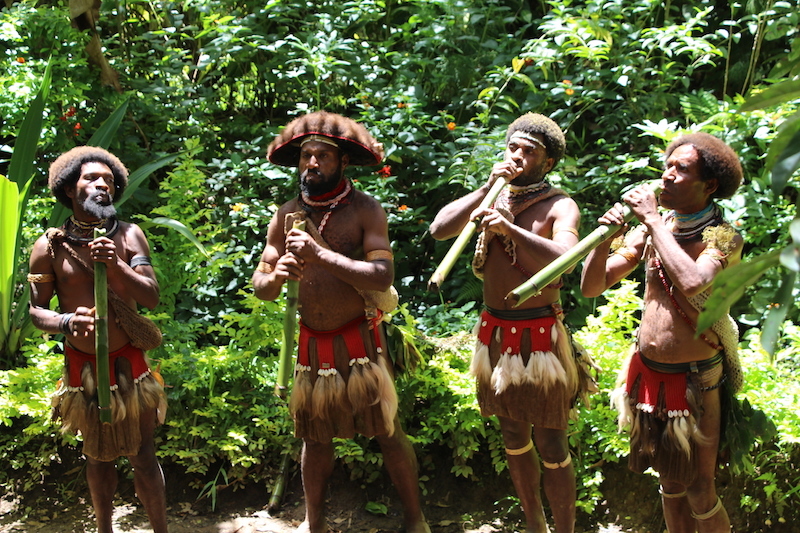 Our closing night in the Huli Highlands will feature a traditional “sing sing” by elaborately attired Huli wig men. After a hearty breakfast today at our lodge, we pack up and depart 50-minutes by bus to Tari’s small airport to board the 10:00 am flight on Air Nuigini to Port Moresby. Arriving in the capital of PNG an hour later, we will have a brief tour of the city on our way to Port Moresby’s Nature Park. 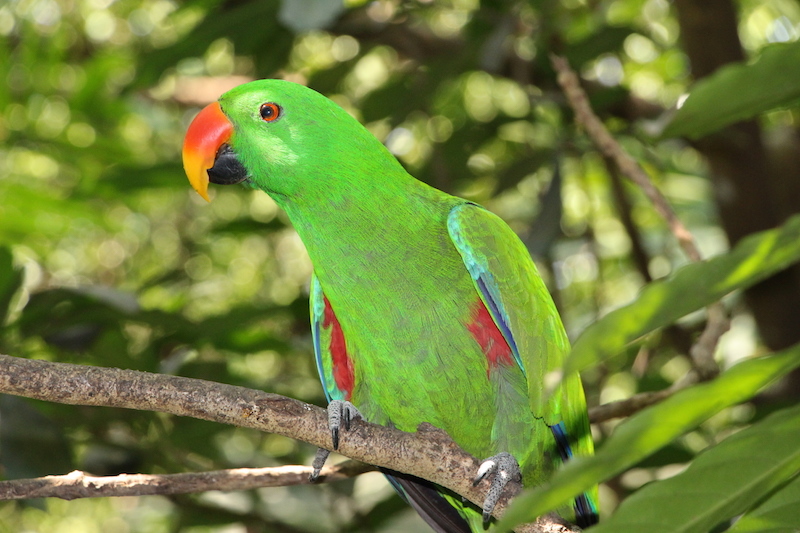 Here students can see many of the unique animals to PNG; from endemic cassowaries, lorikeets, cockatoos, birds of paradise and hornbills to marsupial mammals like wallabies, tree kangaroos, possums and cuscuses. The Nature Park also has an incredible collection of native flora including some of the world’s most prized endemic orchids. Lunch will be served at the Nature Park restaurant before we visit the spectacular National Museum. Here, housed in a Sepik River styled Spirit House, is one of the world’s finest aboriginal collections of utilitarian and ceremonial artifacts. The diversity of human artistic expression found here is unparalleled in the world. In the late afternoon we board a speedboat for Loloata Island, just 15-minutes offshore from Port Moresby where we check into a dive resort for our final three nights. 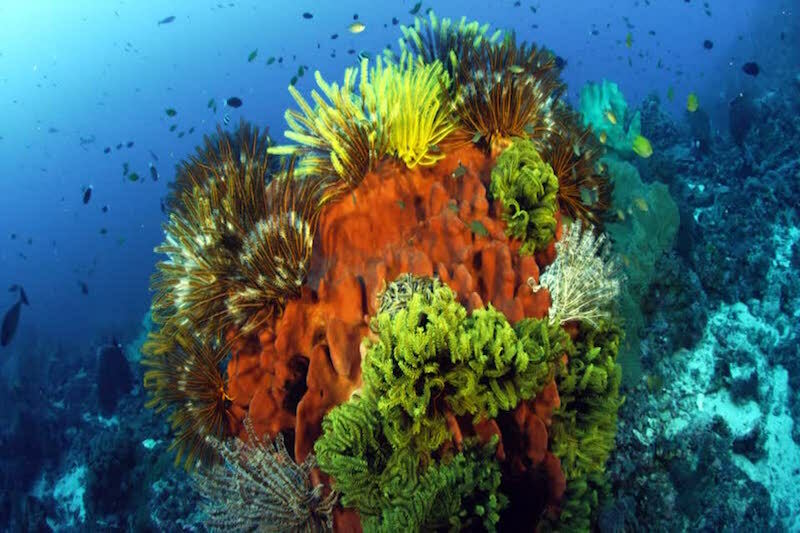 Following dinner this evening, students will have a talk on New Guinea’s place in the Coral Triangle and the astonishing diversity of coral reef life to be found here. Students wanting to get a 360-dregree view of the surrounding islands can climb to the top of Loloata Island this morning for sunrise. Along the way they may see some of the wallabies and spectacular crested pigeons that know this island as home. After a good breakfast we depart by boat to snorkel at the beautiful coral reefs of nearby Lion Island. 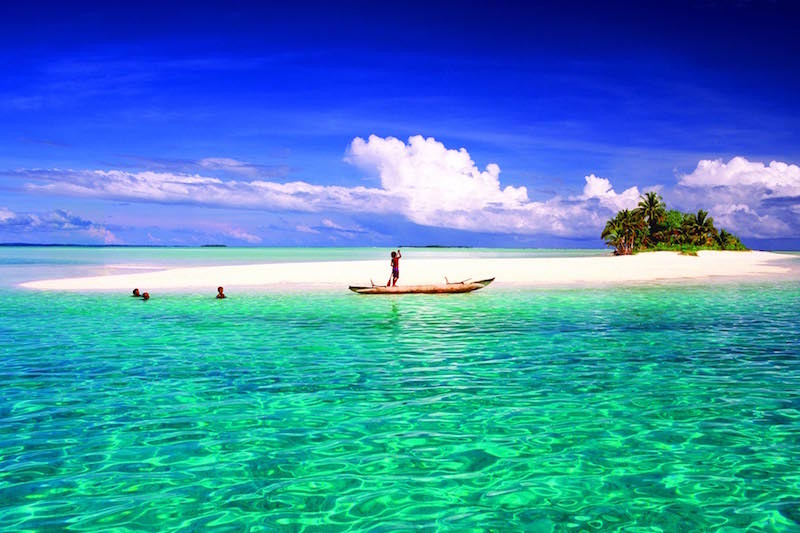 The marine waters of Papua New Guinea are said to teem with more fish per cubic meter than any other place in the world. It is a divers paradise and students are sure to see a wealth of corals and reef species during their snorkeling day. A picnic lunch will be served on the beach today before our afternoon dives and boating back to Loloata Island before sunset. After cleaning up, students will want to gather on the long pier to witness a spectacular sunset before dinner. A campfire on the beach will be our gathering place this evening for guitar songs and an opportunity to witness stars and southern constellations in the unpolluted night sky. Today we change our focus from coastal wildlife to coastal cultures as we have a talk on Melanesian voyageurs right after breakfast. It is now known that the first proven human expansion since our African ancestors colonization Eurasia was the move from Asia to Australia/New Guinea by Southeast Asians who must have been island hopping through the Indonesian archipelago. What’s momentous about this colonization is that it required watercraft – the earliest evidence of its use. Not until 30,000 years later is there evidence of watercraft anywhere else in the world. With the aid of maps, students will chart humanity’s epic migration through Indonesia, Melanesia, Micronesia and Polynesia. They will look at the similarity in cultures and food staples carried on these great voyages and the amazing diversity of languages that resulted. Not until WWII did many of these islanders have contact with the outside world and a number of cargo cults developed as stone-age societies were suddenly thrust into the 20th century. International students will role-play a first contact encounter between two cultures with different values. After lunch at our lodge, we will once again set off by boat to cruise the surrounding waters in search of marine mammals … porpoise, whales and dugong. Conservation efforts to save these endangered species will also be explored through a group discussion when we return ashore. 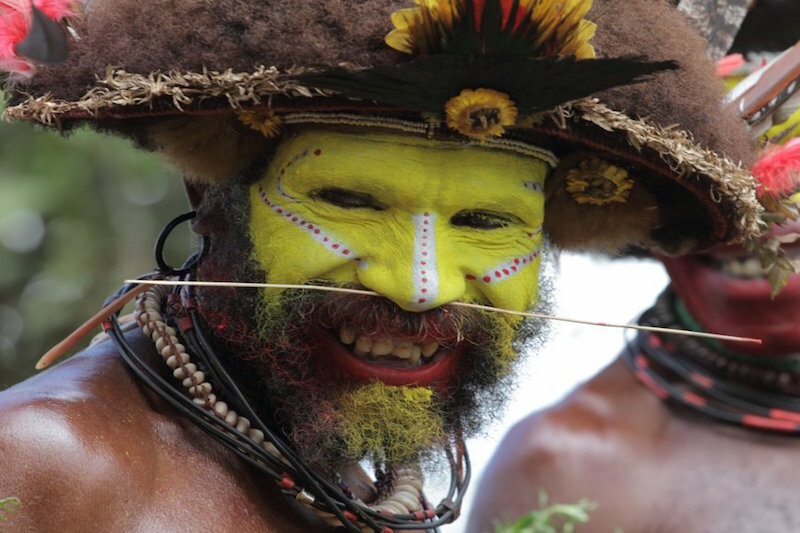 Our final night in New Guinea will feature a closing banquet and “sing sing” with local islanders. The awarding of trip certificates and a closing candle sharing circle will provide all students an opportunity to share highlights of their PNG experiences. Right after breakfast students will pack up and return to Port Moresby’s International Airport for the return flight home.